One of the things we love the most about our house is the view from the backyard. We live in a town, just outside the city limits and we also live in a housing development. HOWEVER, our home is located on the outer loop of the development and we have a huge brush covered field behind us. It is inhabited with deer, foxes and other wildlife. Our children have seen more wildlife here than they did at our other house and it is SO fun to teach them about different animals. We have just begun hunting season around here and the deer are showing up all over the place. They are being scared out of the woods into the open areas and we have been enjoying seeing many deer behind our home. We do not have any foliage for them to eat as far as gardens go and we do have arborvitae trees around our property line which supposedly are deer repellent trees so they stay out of my yard for the most part. Most deer problems are seasonal and tend to worsen in the late fall and winter months as falling temperatures quickly reduce Bambi’s food supply. 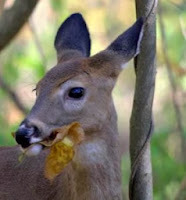 When food is scarce, hungry deer will eat whatever they can find, including fallen leaves, twigs, and buds from woody plant s. To prevent deer from eating and killing trees, bushes and perennials, stop them in their tracks with Sweeney’s® Deer Repellent. 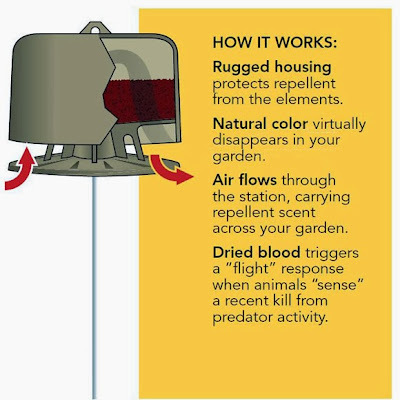 The all-natural, scent-based repellent uses 100 percent dried blood to repel deer from protected areas. Easily detectable by deer, yet odorless to humans, the dried blood triggers a flight response when deer perceive a recent kill from predator activity. 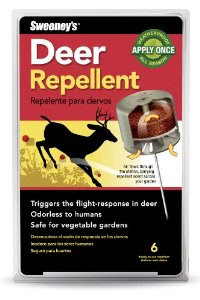 The active ingredient in Sweeney’s Deer Repellent is non-toxic and safe to use in gardens and around children and pets. This sounded like such an easy fix for the deer problems faced by homeowners, I just had to check it out further. So, for this review I was sent a package of Sweeney's Deer Repellent to check out. 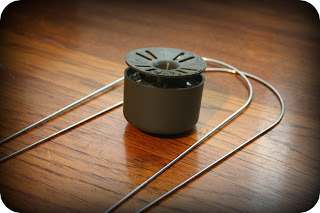 This repellent comes with 6 ready-to-use repellent stations and stakes for easy placement. When I removed one of the stations from the package, there was a dusty residue that came out of the station and right away, I noticed that there was no odor, which was nice. 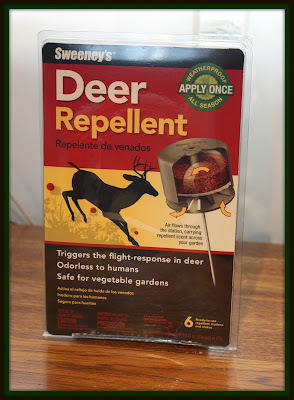 When using Sweeney's Deer Repellent, you need to place them 4-8 feet apart and you can also use them in potted plants, just put one in each pot. My dad has baby walnut trees on the border of his yard...which backs up to 30 acres and he has so much trouble with deer eating the leaves of his little trees. I think the last time I looked, he had black garbage bags hanging off the trees to deter the deer. These repellents would be perfect for him! 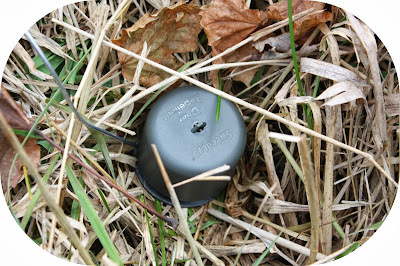 I placed these deer repellent stations on our property line to see if they did any good but I haven't seen any deer for awhile. The good thing is that these stations will be good for the entire season and are also waterproof so they will withstand the weather here. I don't like chasing the deer away because they are fun to watch but when I get my veggie garden in next spring, the deer may not be so much fun anymore. Here's hoping these stations do their job properly! 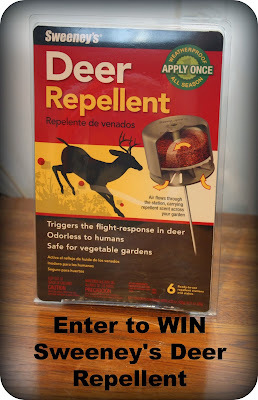 A six-pack of Sweeney's Deer Repellent retails for about $17.99. Sweeney’s products are widely distributed at all leading hardware, home center, mass merchant, food and drug, farm and fleet and independent garden center retailers nationwide. You can keep up with Sweeney's on Facebook and also on Twitter as well. Disclaimer: I received no monetary compensation for this post. I did receive free products for review purposes. All quotes and stock photos are from the sponsor's website and email. Prize is being provided and shipped by the sponsor. This blog is not responsible for lost, stolen or damaged prizes. All thoughts and opinions are 100% mine. Thanks for sharing this information about Sweeney's Deer Repellent! Raccoon's cause me the most trouble, we just moved and they are everywhere! Deer.... especially during the rut. It would have to be deer - they love my garden. racoons!!!! they get into everything!! and once they get something they keep coming back forever! !